Last year, I had the privilege of demonstrating tatting at the Historic Skills Fair. It was a nice relaxing day of tatting, teaching, and chatting. In fact, it was such a relaxed atmosphere that I forgot to take any photos until the event was over. The mission overlooks a marvelous view and I had just found a setting on my phone’s camera that I didn’t know it had. So I managed to snap a few pictures of the view and none of the actual fair. This year I plan to get pictures of the fair as well as some additional view shots. Luckily, one of the park staff managed to snap a couple photos at our booth. She took a shot of Jan’s tatting display, the baby booties I was working on, and Patti’s hands demonstrating a reverse half-hitch knot. You can see the other photos taken of the 2013 skill fair on the Coeur d’Alenes Old Mission State Park Facebook page. Last year we were between a group of spinners and a gentleman with an interactive tutorial on how to prepare a musket cartridge. There were many things to experience at the Historic Skills Fair. A gun shot sounded off the hour on Saturday. I wasn’t able to make Sunday, but I’m told that’s when they shot off the cannon on the hour. There was a young lad demonstrating how to use flint and steel to start a fire. He was really good at it too (tended to take him two minutes or less for each fire he demonstrated). There was a group of demonstrators explaining the various tools and techniques used to make the Cataldo Mission. I was informed that there were no metal nails used in the construction. They used a joining method with large wooden dowel pieces for nails. The restoration that has been done to the buildings is wonderful. It is a very peaceful place inside the church. The fair also featured mountain men, several handmade craft vendors, and the Lion’s Club selling food. There was also a spot where you could learn how to make a rag rug. My favorite booth (aside from our tatting one) was the blacksmith. He had set up a portable forge. The fire was memorizing (I could have easily watched it all day) and I’ve always wanted to learn more about the process. This is one craft I still would like to try my hand at. I’m sure many of these amazing people will be back tomorrow and we will have a good showing from the guild. Come learn how to tat and take in the many other sites to see at the Historic Skills Fair. I greatly enjoyed my time demonstrating at the Heritage Show today and look forward to spending some more time out there tomorrow. We were able to meet a lot of great people. There were several who tried tatting for the first time today and others who refreshed old skills or received clarity that they could not get from a book. My advice to all of them is keep on tatting – it takes practice and the guild is here to help! I had the delightful opportunity to teach T. She is a sweet little girl with lots of patience. She stopped by, admiring the tatted bracelets, and wanted to get one. I told her that we could teach her how to make one. Her eyes lit up and we set about the process. Her hands were too little to hold the thread on her left hand – so I held onto the end while she worked. She quickly got the hang of the flip and even learned the process of undoing a knot when it didn’t flip. 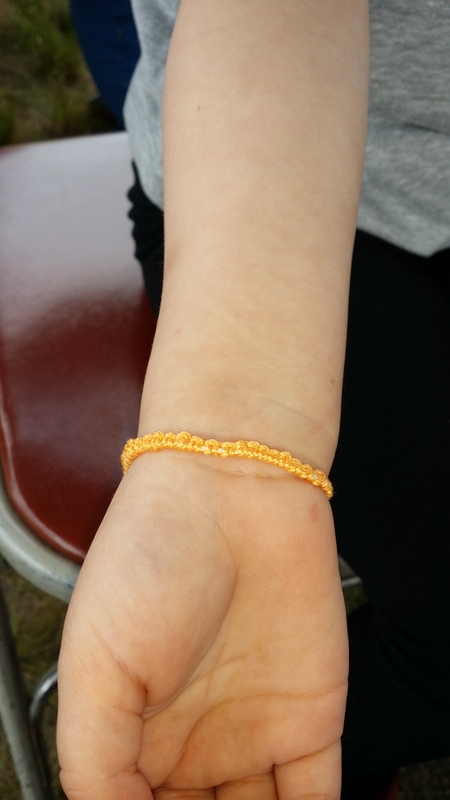 She patiently sat and made knot after knot until she had a chain long enough to go around her wrist as a bracelet. T and the bracelet she tatted. A close up of her bracelet. 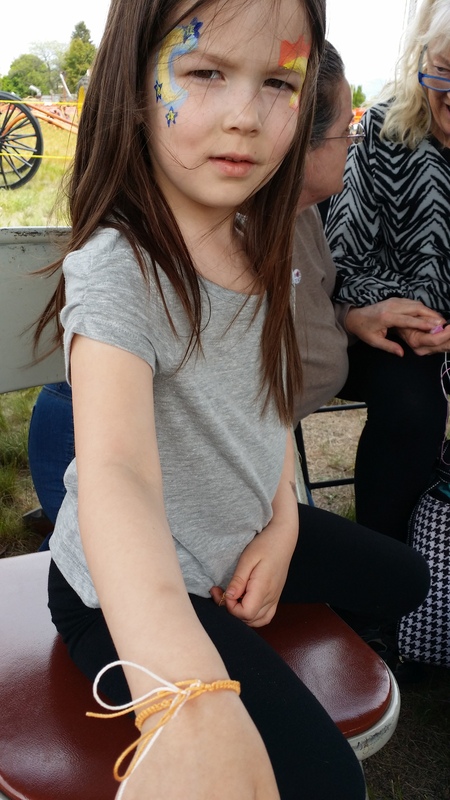 T showing off her bracelet. T made great progress for her first day tatting! She and her aunt went home with a shuttle. I hope she continues. 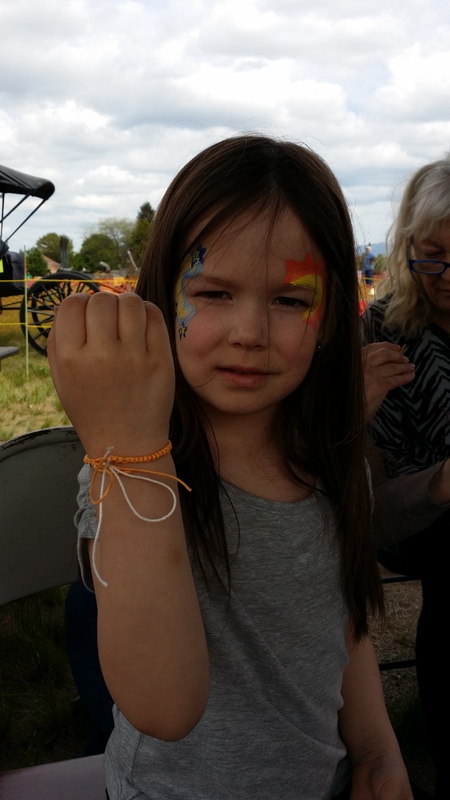 Patty also made her a butterfly and flower while T worked diligently on her bracelet. At one point in the afternoon I got to try spinning. My love of spinning wheels just went up another notch… I have a feeling that hobby might be in my distant future. The gal that let me spin thinks she might eventually try tatting, but that she better master the looms she has first. She had a very pretty spinning wheel. I wish I had gotten a picture. Towards the end of the day I got to talk with this lovely lady. 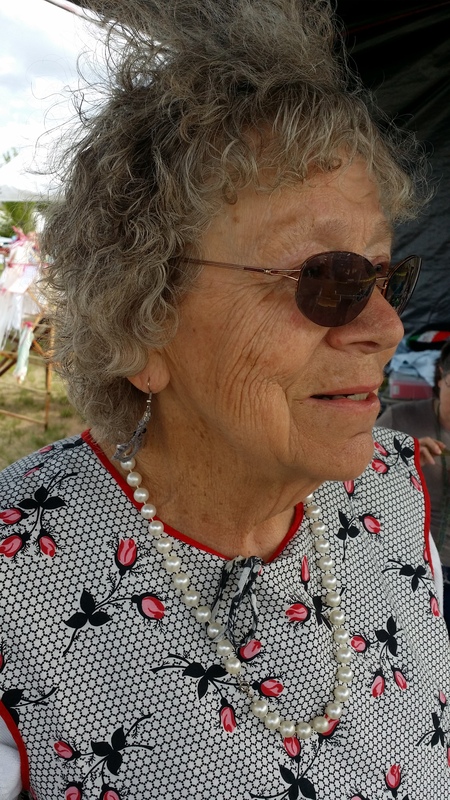 Her name currently escapes me, but she was wearing tatted owl earrings that her granddaughter’s (Leina) friend in Tennessee made. 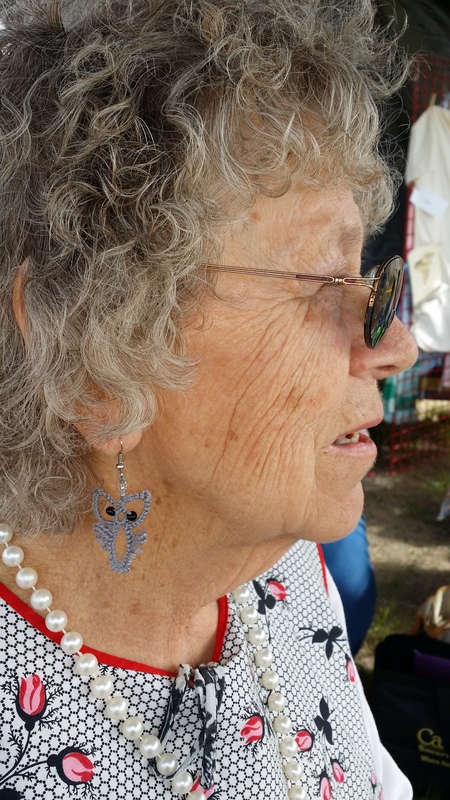 Owl earrings made by a tatter in Tennessee. We will be demonstrating tomorrow from 10:00 am to 5:00 pm for the last day of the 7th Annual Eastern Washington Heritage Show, 10200 E Sprague Ave, Spokane Valley WA. Look for the tents on the northeast corner of Sprague and Herald. Come join us if you can. I do hope that the ladies and gentleman who tried their hands at tatting today continue! I greatly enjoy seeing our tatting community grow! Several members of the Shuttlebirds Tatting Guild will be at the Spokane Interstate Fair tomorrow, Sept. 14, giving tatting demonstrations. If you find yourself at the fair, please stop by and say hello. They will be giving demonstrations from 10 am to noon. Last weekend, I had the privilege of demonstrating tatting at the Historic Skills Fair. It was a nice relaxing day of tatting, teaching, and chatting. In fact, it was such a relaxed atmosphere that I forgot to take any photos until the event was over. The mission overlooks a marvelous view and I had just found a setting on my phone’s camera that I didn’t know it had. So I managed to snap a few pictures of the view and none of the actual fair. Luckily, one of the park staff managed to snap a couple photos at our booth. She took a shot of Jan’s tatting display, the baby booties I am working on, and Patti’s hands demonstrating a reverse half-hitch knot. You can see the other photos taken of the skill fair on the Coeur d’Alenes Old Mission State Park Facebook page. If you are local, you should add attending next year’s Historic Skills Fair to your calendar (it should be the weekend of the 2nd Sunday of July). We were between a group of spinners and a gentleman with an interactive tutorial on how to prepare a musket cartridge. Then Sunday was my 6th year wedding anniversary. The only reason I’m including this is because my awesome hubby got me a beautiful handmade shuttle and tatting supplies as my anniversary gift.